The mechanical function of the cervix becomes crucial during pregnancy when it resists the compressive and tensile forces generated from the growing fetus. Premature cervical remodeling and accelerated tissue softening is hypothesized to cause early cervical dilation leading to extremely premature birth. The overall goal of our group is to understand the process of cervical tissue remodeling and the corresponding material properties of the cervix during pregnancy. In this talk, cervical tissue remodeling will be described through investigating the mechanical and biochemical properties of ex vivo cervical tissue specimens. A material model will be presented that accounts for the anisotropy of cervical collagen fibers, and possible remodeling relationships will be presented as a function of the tissue's biochemical composition. Finally, a 3-D finite element model of pregnancy derived from MRI data will ! be presented to evaluate the mechanical performance of the cervix during pregnancy. 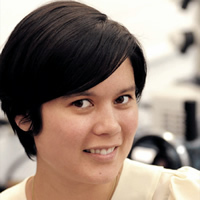 Kristin is an Assistant Professor in the Department of Mechanical Engineering at Columbia University in the City of New York. Her current obstetrics research is done in collaboration with the Department of Obstetrics and Gynecology at the Columbia University Medical Center. She received her Mechanical Engineering doctorate and master's degree from MIT and her bachelor's degree from the University of Michigan.